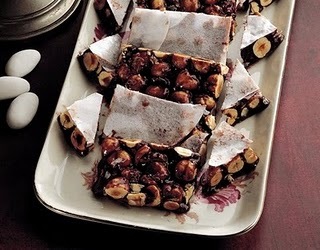 During a stopover in France do not forget ya taste traditional sweets called Nougat this. This yummy sweets prepared with sugar or honey, pistachio nuts, almonds, hazelnuts plus other dried fruits. Nougat texture is different, there are no hard soft depending on the material used. Not only is the texture, the color can be different. White nougat made with egg whites, whereas brown nougat is made from sugar caramel and more kriuk kriuk when chewed. still remember the movie the chronicles of narnia: the lion, the witch, and the wardrobe is popular is it? 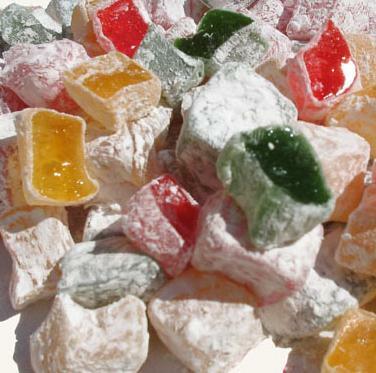 in the movie there is a scene where the white edmund frank Witch that his favorite candy is a Turkish Delight! confectionery whose real name is Lokum or cyprus delight emang deserve a lot orang.teksturnya favorite soft and sticky like jelly beans kaang plus smaller pieces such as walnuts, almonds or walnuts and a sprinkling of powdered sugar around it, make sense of this candy Legiiiiiiit really. Candy that has been produced since the 15th century is derived from the Turkish state. but thanks to the delicious, turkish delight can be famous all over Europe and dunia.bahkan in the UK, this can be a nickname hanhish candy candy because it can make people addicted to eating. This candy bar was the forerunner various forms penmen 'sticky gelatin' is popular in many countries! soft candy was invented by Hans Riegel of town bonn in germany in 1922. the tiny colorful was originally named gummibar or gummibarchen which in English became gummy bear. candy fame reached the United States. 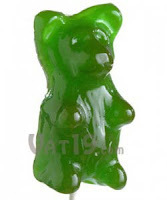 There gummy bear has five distinctive flavor. the raspberry (red), orange (orange), strawberry (green), pineapple and lemon (yellow). 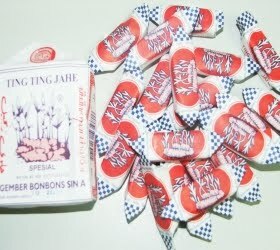 Ginger candy it is a relatively old-fashioned candy. Speaking of sweets is not just talking decades ago, but hundreds of years. At least candy is already recorded in the book Island of Java by John Joseph Stockdale, an English traveler, who said, in 1778 the Dutch sent as much as 10,000 pounds (or about 5,000 kilograms) product called Candied ginger from Batavia to Europe. This food is popular in Europe because the cure bloating or in scientific terms is called flatulence. Chewing is also Ideal for keep warm and refreshing throat. Moreover, when the air is cold. Original candy is originally from Indonesia. Country known as spice. This candy came from jepang.Botan Rice Candy is very soft, chewy, tasted like lemon rice and coated wrapping paper. 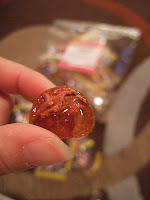 This candy such as plastic and dry, but if they will be eaten candy will melt in your mouth. 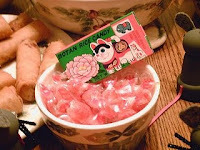 It is a traditional Japanese sweets, and it is being imported to North America from Japan by JFC International.Permen Botan Rice comes in a small cardboard box containing a 3/4 oz. (21 grams) of candy. Each box contains six individual pieces and stickers. Prior to 1998, each box contains a small plastic toy. Name that candy, Botan (kanji:?, Hiragana:? ), Meaning 'peony' in Japanese. A peony blooms appear on the label, in addition to hariko-Inu, traditionally shaped dog toys for the children of Japan. 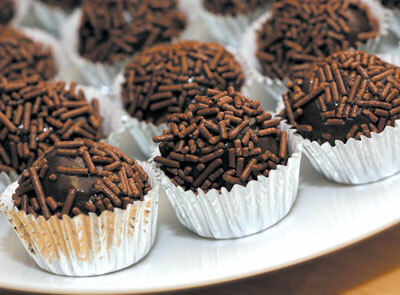 It is said that a birthday party in brazil ga anak2 be lively if not available sweets made from milk and cocoa powder ini.nama Brigadeiro itself is taken from the name of the air force general in brazil in the 1940's, Brigadier Eduardo Gomez. so the story goes, when the candy was first created, Brigadier Eduardo Gomez was famous for successfully eradicate pemberontak.makanya candy is named after the general's honor jasanya.rasanya a tasty and interesting shapes make this candy is often the frosting on the cake and ice cream.